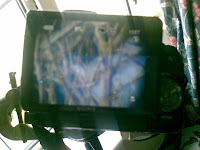 I was content to do normal bird photography with my Sony DSC H9, until one day I discovered the world of Digiscoping on the internet. For a few weeks I convinced myself that with my current state of affairs, the equipment was beyond my means and any more oggling would only lead to a non-existant savings account! However, we have a saying that what is meant to happen will not get stuck on its way. I heard the news that ALDI had been selling a good quality spotting scope for a mere £24.99! I read up countless birding and archery forums , all of which described the scope as being exceptional value for the price! I had to get my hands on one. Unfortunately it was already a month and a half past the date that the item arrived in shops and people had already described how the item had gone out of stock hours after it arrived in stores across the country. I still decided to take a chance and cycled an unknown distance to a relatively obscure ALDI, and would you believe it! There were three pieces left! I snapped up one without delay! I can confirm that as mentioned on the above forums, the scope is truly value for money, with great clarity and sharp focus even at 60 times zoom. Branded as a Traveler spotting scope or as an Adventuridge, it is specially made for ALDI by SUPRA .The scope has a 30-60 times zoom eye piece with a 60 mm objective. 60 mm is not exceptional but its good enough for light gathering. ...and thus, I was the proud owner of a scope and on my way to digiscoping! The question that I now needed to answer was if the DSC H9 could be matched up to the ALDI scope for digiscoping. Preliminary experiments, holding the camera to the lens resulted in huge vignetting and very blurry out of focus pics as you can see in this picture. I was going to have to find a way to fix my camera to the scope. The only means of doing this is through an adapter, and adapters are quite expensive. They would cost me atleast as much as the scope itself, which I find hard to accept. Thus I resolved to make my own adapter. Initially I tried punching a eye piece sized hole in a brylcreem container , fit it smugly over the eye piece and then slot the other end into my 74mm camera adapter. That did'nt work as the camera wouldnt stay fixed. A few days later, when I was working in my lab, my eyes chanced across some old test tube/ titration clamps and joints, and I thought theyd make perfect building material for a type of adapter...and so they did! 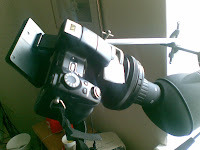 With two clamps, two joints and a connecting rod, I could build a customisable adapter that can fit my camera into just the right position. I clamped one clamp over the barrel of the Scope at the objective end, ensuring that the scope did not get scratched by placing a strip of rubber in between. I then connected a rod perpendicular to the first clamp and connected the second clamp perpendicular to this at the other end. This placed the jaws of the second clamp just above the scope eye piece. I could now clamp my camera into this clamp so that it fitted smug over the scope eye piece. In order to protect the lens from accidental scratches I fixed the UV adapter I had bought earlier to the adapter, ensuring that this useless piece of glass would put itself to use. The lens of the DSC H9 is still considerably bigger than the scope and the vignetting is massive but when placed on a tripod, and zoomed in 15x the vignetting is considerably reduced and the blurred focus can be corrected to a certain extent. However, The camera refuses to be without shake and catches even the slightest movement resulting in quite blurred pics. The camera at the end of the scope is also a heavy weight and takes its toll on the tripod and makes what is already a tough job of focussing on a distant bird even tougher. Unfortunately it doesnt speak much for the digiscoping ability of the DSC H9, although it speaks volumes for the zoom ability of the digiscope itself . Heres what the images look like at full 15x zoom with only the camera. It looks like I can conclude this by saying the DSC H9 just isnt cut out for digiscoping. Give it up and try another camera! Thats just what I did. I bid for a Konica Minolta Dimage X20 on ebay and won it for just £12! Its only a 2 mp camera, but from the images I`ve seen it produce on flickr, it looks impressive. Besides its a 3x non extending optical zoom, which is just perfect for typical digiscoping. I`m looking forward to getting it and trying it out on my scope. Keep watching this space for more. I also have an H9. I was just wondering if you tried using the IR remote control to reduce camera shake by allowing you to shoot without touching the rig at all. Hi brad, glad you found it interesting. I did try the remote a few times but my remote battery is totally out and I`ll have to get a new one. In fact i thought that having a remote is an advantage for digiscoping with the h9, but as you can see the resulting images just isnt good enough.